There is good reason that Tru ranks among writer Jay Presson Allen’s most celebrated and popular plays. The new production that opened on Friday, December 2, at the Palm Beach Dramaworks Theatre, is a drama about the life of outlandish writer Truman Capote humorously dishing on the life of the artist before he skidded into his decline. The play captures the essence of the novelist, who at the peak of his writing career was known as the darling of New York City’s society’s inner circle, until he told their best kept secrets. In the 60s, at a time when most women were a rarity in the profession, Allen made a mark as a screenwriter, playwright, stage director, television producer and novelist. In 1989, she wrote Tru, which made it to Broadway in 1991. She had not known Capote, but his friends say she captured the intrinsic nature of the man. In an interview with the “New York Times” in 1972, Allen said that the essence of a successful adaptation is to not “muck around with the essence” of the original work. 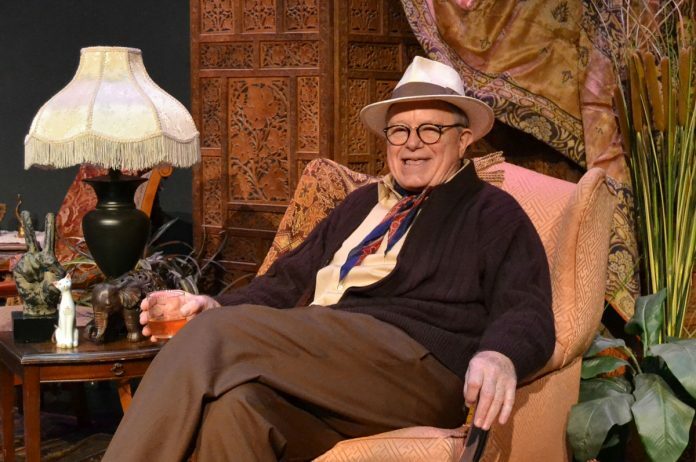 Allen’s one-man play, here directed by Lynette Barkley, has a fine edge where we discover Truman Capote as a court jester to the rich and famous. Set in 1975, the sporadically funny and somber [albeit all the vodka drinking] play begins with Capote in his luxurious living room of his United Nations high-rise apartment in NYC, already on a course of self-destruction. Rob Donohoe, a veteran Broadway actor who has played many diverse roles, expertly takes on Capote’s distinctive high-pitched voice, slight lisp, and Southern accent, as well as his physical appearance in a way that is a true tribute to Truman Capote. Even for those people familiar with Capote’s story, as the play progresses we begin to see him in a new light. Between witty and sometimes vulgar one-liners, Capote talks to his audience about his “Swans” — Babe Paley, Slim Keith, Lee Radziwill, C.Z. Guest, Gloria Guinness and Marella Agnelli — the women in his exclusive club. Through phone conversations between Capote and a few friends left from his inner circle, we learn that in a desperate attempt to be funny, to be liked or perhaps to belong, he gave several chapters of his unpublished novel Answered Prayers to Esquire magazine. In it, there were sordid and jaw-dropping revelations, admissions, and thinly veiled interpretations of his close friends. They cut Capote from their lives and he is now weathering the controversy, alone. The one thing he fears most. Left to pick up the pieces, Capote examines his life as a solitary Christmas approaches. And that is where we find him. Confused, trying to make sense of lost times and lost relationships, while dealing with his intoxication of drugs and heavy drinking. The play moves to a harrowing conclusion on Christmas Eve, as Capote looks straight to the audience and says, “Life is a badly written play with a marvelous third act.” With this silent outburst, he takes off his house coat, looks in a mirror and combs his hair back with his hands. He walks toward stage right where he dons his famous bohemian type attire that looks too large on such a small man: black heavy winter coat, red scarf, dark glasses, and black hat, tipped to one side. He walks offstage. Lights out. What kind of future does Capote have in mind? The audience is left to wonder. “I always knew that I wanted to be a writer and that I wanted to be rich and famous,” Truman Capote told the New York Times in 1978. Unfortunately, he got his wish. Besides Donohoe’s brilliant performance, Tru is a polished play that reveals the way in which Truman Capote came to capitalize on his novels as much as on his fame. Tru runs through Jan. 1, 2017 at Palm Beach Dramaworks, 201 Clematis St., West Palm Beach. For tickets or for more information, call (561) 514-4042 or visit palmbeachdramaworks.org.